You captured it: that Roller Derby Feeling! 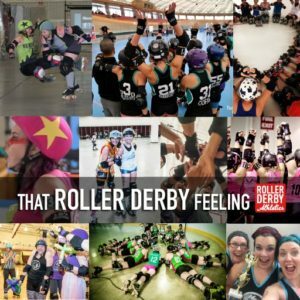 A few weeks back I asked you to send me the pictures that best represented your roller derby experience – the highs, the lows, the silly team moments, the epic fails, and the badass moments of pure victory and joy. To get your hands on the free training program mentioned in the video, just click here! To see the credits for all the fab skaters and photographers featured in the video, scroll to the end of this post! The promo premiered on the broadcast for The Big O tournament this past weekend, and it was a great event once again. Those top-tier teams were playing their hearts out, and putting thousands and thousands of hours of practice time, strategy sessions, and off-skate training to the test. The athleticism was incredible, inspiring, and sometimes even jaw-dropping. I’ll have some more blog posts coming soon about what I learned watching some of the bouts, and how it can apply to skaters at every level. Being there on-site with Roller Derby Athletics (and Girls On Track – but that’s another story for another day! ), I also got the chance to talk to lots of skaters who have followed one of my videos, or participated in a training program with RDA, or are Members! It’s always a joy for me to meet my athletes in person. And it’s also a great experience to meet people who have never heard of Roller Derby Athletics before. I founded Roller Derby Athletics nearly 5 years ago. My vision statement was “to be the foremost authority on off-skate training for the sport of roller derby around the world.” This may sound cocky, but I believe I have achieved that vision. 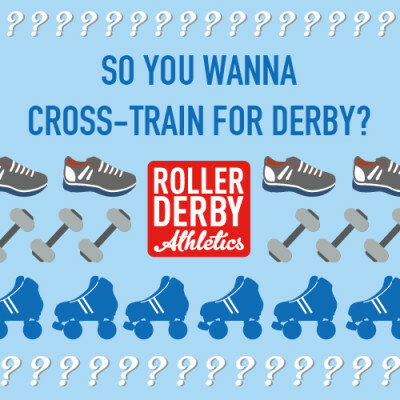 I think that if people are looking for cross-training support for derby, they will find me, and I will be able to help them. My new vision for the next few years is for Roller Derby Athletics’ content to be known and used by every roller derby league in the world, to keep their members safe, strong, and unstoppable. Make sure your league knows about the free BasicsBuilder program. It’s 8 minutes a day for building and/or maintaining functional roller derby strength. No equipment required. Share the Training Resources page with your fresh meat. Incorporate an off-skates warm-up and short conditioning workout with your fresh meat training sessions, to help them avoid injuries and level up faster. Need help? I’d be happy to point you in the right direction! When someone in your league asks “I have ‘X’ fitness challenge, what should I do to overcome it?” make sure they know to use the search bar at the top left of every page on this site to see what they can find from FIVE YEARS of blog posts and content… it’s probably been addressed! And if that doesn’t work, they can always email me from the Contact page and I will do my best to point them in the right direction! Tell your people to sign up for my email newsletter – then they’ll get all my free content directly. It’s in the blue box below. What did you think of the ad? Let me know in the comments! And Slamabama and the Leicestershire Dolly Rockit Rollers with the fantastic victory moment at the very end. And many more thanks to folks who submitted fantastic images that just weren’t able to make the cut! They were all great! This is so cool! My heart jumped a bit bc it’s intense and powerful. Great work! Cool idea! So glad you got that feeling, FoxAnne!! This sounds silly, but I was glad you said “God-damned laps test.” And not like, “darn.” :-) It’s a great montage, Booty. Keep up with all you do. And I agree, you are the foremost authority! Love this! It turned out so well! And such a great showcase for the sport and your All Stars! Thanks Han! And thanks for being such a great, engaged Member here!